Good news are coming to all of those who love Indonesia furniture. Because the Singapore biggest export furniture exhibition (IFFS) 2018 will be held soon in Singapore EXPO Convention and Exhibition Centre. 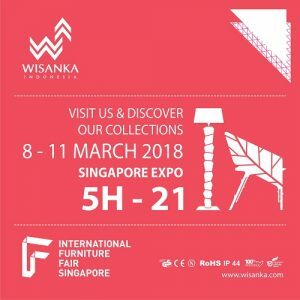 In 2018 IFFS, Wisanka offers the largest range of specialty furniture, craft, decorative accessories, interiors, and lighting products. It serves the nation biggest meeting place for buyers, manufacturers, traders and contract project purchasers, where you can buy directly from the source. In 2018, IFFS is set to achieve even greater success. A major extension of the Singapore EXPO Convention and Exhibition Centre halls will allow IFFS to be even bigger and more vibrant than ever before. There will be more exhibitors and an even wider selection of products on display. WISANKA will be joining as one of the participants of IFFS 2018. In this exhibition, WISANKA will promote our new collection of Indoor Furniture, Natural Rattan Furniture, Lighting products, Product for Hotel, for Restaurant, for Resort and many more. We invite you to come to our booth in IFFS 2018. The exhibition will be open on March 8 until 11, 2018. Make sure you are part of it. Make sure you participate in IFFS 2018 !